Speaking My Mind: I believe! That is in Global Warming! I have for nearly two decades. And no, it isn't something in our futures it is showing up all over the world daily! Glaciers melting, causing water levels of oceans and seas to go up significantly, volcanic eruptions, earthquakes, more hurricanes and on and on and on. Anyone who has access to weather/climate news knows this! We have been living in Florida since 1986 and yes things have changed, our two to three weeks of cold weather have slowly diminished. This winter we had 90s in February! And in our old homestead of New Jersey has blurred lines for seasons that they used to have four distinct ones and they have had flooding and hurricanes too! 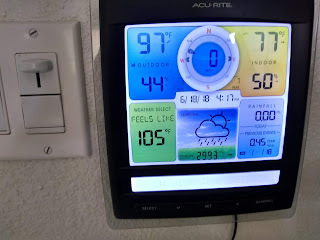 Below is a picture of our news weather station once again today, showing what I mean, it does have the date and time on it too. This is not normal for Florida people, lower than indoor humidity and so very, very hot! CRAZY! Now you probably realize why unless we have to go out we don't. And then we go from our centrally air-conditioned home to our air-conditioned car to an air-conditioned building! We are true believers, as anyone should be. Replace a regular incandescent light bulb with a compact fluorescent light bulb (cfl)CFLs use 60% less energy than a regular bulb. This simple switch will save about 300 pounds of carbon dioxide a year.We recommend you purchase your CFL bulbs at 1000bulbs.com, they have great deals on both screw-in and plug-in light bulbs. Install a programmable thermostatProgrammable thermostats will automatically lower the heat or air conditioning at night and raise them again in the morning. They can save you $100 a year on your energy bill. Move your thermostat down 2° in winter and up 2° in summerAlmost half of the energy we use in our homes goes to heating and cooling. You could save about 2,000 pounds of carbon dioxide a year with this simple adjustment. Clean or replace filters on your furnace and air conditionerCleaning a dirty air filter can save 350 pounds of carbon dioxide a year. Choose energy efficient appliances when making new purchasesLook for the Energy Star label on new appliances to choose the most energy efficient products available. Wrap your water heater in an insulation blanketYou’ll save 1,000 pounds of carbon dioxide a year with this simple action. You can save another 550 pounds per year by setting the thermostat no higher than 50°C. Move your fridge and freezerPlacing them next to the cooker or boiler consumes much more energy than if they were standing on their own. For example, if you put them in a hot cellar room where the room temperature is 30-35ºC, energy use is almost double and causes an extra 160kg of CO2 emissions for fridges per year and 320kg for freezers. Defrost old fridges and freezers regularlyEven better is to replace them with newer models, which all have automatic defrost cycles and are generally up to two times more energy-efficient than their predecessors. Don’t let heat escape from your house over a long periodWhen airing your house, open the windows for only a few minutes. If you leave a small opening all day long, the energy needed to keep it warm inside during six cold months (10ºC or less outside temperature) would result in almost 1 ton of CO2 emissions. Replace your old single-glazed windows with double-glazingThis requires a bit of upfront investment, but will halve the energy lost through windows and pay off in the long term. If you go for the best the market has to offer (wooden-framed double-glazed units with low-emission glass and filled with argon gas), you can even save more than 70% of the energy lost. Get a home energy auditMany utilities offer free home energy audits to find where your home is poorly insulated or energy inefficient. You can save up to 30% off your energy bill and 1,000 pounds of carbon dioxide a year. Energy Star can help you find an energy specialist. Cover your pots while cookingDoing so can save a lot of the energy needed for preparing the dish. Even better are pressure cookers and steamers: they can save around 70%! Use the washing machine or dishwasher only when they are fullIf you need to use it when it is half full, then use the half-load or economy setting. There is also no need to set the temperatures high. Nowadays detergents are so efficient that they get your clothes and dishes clean at low temperatures. Take a shower instead of a bathA shower takes up to four times less energy than a bath. To maximize the energy saving, avoid power showers and use low-flow showerheads, which are cheap and provide the same comfort. Use less hot waterIt takes a lot of energy to heat water. You can use less hot water by installing a low flow showerhead (350 pounds of carbon dioxide saved per year) and washing your clothes in cold or warm water (500 pounds saved per year) instead of hot. Use a clothesline instead of a dryer whenever possibleYou can save 700 pounds of carbon dioxide when you air dry your clothes for 6 months out of the year. Insulate and weatherize your homeProperly insulating your walls and ceilings can save 25% of your home heating bill and 2,000 pounds of carbon dioxide a year. Caulking and weather-stripping can save another 1,700 pounds per year. Energy Efficient has more information on how to better insulate your home. Be sure you’re recycling at homeYou can save 2,400 pounds of carbon dioxide a year by recycling half of the waste your household generates. Recycle your organic wasteAround 3% of the greenhouse gas emissions through the methane is released by decomposing bio-degradable waste. By recycling organic waste or composting it if you have a garden, you can help eliminate this problem! Just make sure that you compost it properly, so it decomposes with sufficient oxygen, otherwise your compost will cause methane emissions and smell foul. Buy intelligentlyOne bottle of 1.5l requires less energy and produces less waste than three bottles of 0.5l. As well, buy recycled paper products: it takes less 70 to 90% less energy to make recycled paper and it prevents the loss of forests worldwide. Choose products that come with little packaging and buy refills when you canYou will also cut down on waste production and energy use… another help against global warming. Reuse your shopping bagWhen shopping, it saves energy and waste to use a reusable bag instead of accepting a disposable one in each shop. Waste not only discharges CO2 and methane into the atmosphere, it can also pollute the air, groundwater and soil. Reduce wasteMost products we buy cause greenhouse gas emissions in one or another way, e.g. during production and distribution. By taking your lunch in a reusable lunch box instead of a disposable one, you save the energy needed to produce new lunch boxes. Plant a treeA single tree will absorb one ton of carbon dioxide over its lifetime. Shade provided by trees can also reduce your air conditioning bill by 10 to 15%. The Arbor Day Foundation has information on planting and provides trees you can plant with membership. Switch to green powerIn many areas, you can switch to energy generated by clean, renewable sources such as wind and solar. In some of these, you can even get refunds by government if you choose to switch to a clean energy producer, and you can also earn money by selling the energy you produce and don’t use for yourself. Buy locally grown and produced foodsThe average meal in the United States travels 1,200 miles from the farm to your plate. Buying locally will save fuel and keep money in your community. Buy fresh foods instead of frozenFrozen food uses 10 times more energy to produce. Seek out and support local farmers marketsThey reduce the amount of energy required to grow and transport the food to you by one fifth. Seek farmer’s markets in your area, and go for them. Buy organic foods as much as possibleOrganic soils capture and store carbon dioxide at much higher levels than soils from conventional farms. If we grew all of our corn and soybeans organically, we’d remove 580 billion pounds of carbon dioxide from the atmosphere! Eat less meatMethane is the second most significant greenhouse gas and cows are one of the greatest methane emitters. Their grassy diet and multiple stomachs cause them to produce methane, which they exhale with every breath. Reduce the number of miles you drive by walking, biking, carpooling or taking mass transit wherever possibleAvoiding just 10 miles of driving every week would eliminate about 500 pounds of carbon dioxide emissions a year! Look for transit options in your area. Start a carpool with your coworkers or classmatesSharing a ride with someone just 2 days a week will reduce your carbon dioxide emissions by 1,590 pounds a year. eRideShare.com runs a free service connecting north american commuters and travelers. Don’t leave an empty roof rack on your carThis can increase fuel consumption and CO2 emissions by up to 10% due to wind resistance and the extra weight – removing it is a better idea. Keep your car tuned upRegular maintenance helps improve fuel efficiency and reduces emissions. When just 1% of car owners properly maintain their cars, nearly a billion pounds of carbon dioxide are kept out of the atmosphere. Drive carefully and do not waste fuelYou can reduce CO2 emissions by readjusting your driving style. Choose proper gears, do not abuse the gas pedal, use the engine brake instead of the pedal brake when possible and turn off your engine when your vehicle is motionless for more than one minute. By readjusting your driving style you can save money on both fuel and car mantainance. Check your tires weekly to make sure they’re properly inflatedProper tire inflation can improve gas mileage by more than 3%. Since every gallon of gasoline saved keeps 20 pounds of carbon dioxide out of the atmosphere, every increase in fuel efficiency makes a difference! When it is time for a new car, choose a more fuel efficient vehicleYou can save 3,000 pounds of carbon dioxide every year if your new car gets only 3 miles per gallon more than your current one. You can get up to 60 miles per gallon with a hybrid! You can find information on fuel efficiency on FuelEconomy and on GreenCars websites. Try car sharingNeed a car but don’t want to buy one? Community car sharing organizations provide access to a car and your membership fee covers gas, maintenance and insurance. Many companies – such as Flexcar – offer low emission or hybrid cars too! Also, see ZipCar. Try telecommuting from homeTelecommuting can help you drastically reduce the number of miles you drive every week. For more information, check out the Telework Coalition. Fly lessAir travel produces large amounts of emissions so reducing how much you fly by even one or two trips a year can reduce your emissions significantly. You can also offset your air travel carbon emissions by investingin renewable energy projects. Encourage your school or business to reduce emissionsYou can extend your positive influence on global warming well beyond your home by actively encouraging other to take action. Join the virtual marchThe Stop Global Warming Virtual March is a non-political effort to bring people concerned about global warming together in one place. Add your voice to the hundreds of thousands of other people urging action on this issue. Encourage the switch to renewable energySuccessfully combating global warming requires a national transition to renewable energy sources such as solar, wind and biomass. These technologies are ready to be deployed more widely but there are regulatory barriers impeding them. U.S. citizens, take action to break down those barriers with Vote Solar. Protect and conserve forest worldwideForests play a critical role in global warming: they store carbon. When forests are burned or cut down, their stored carbon is release into the atmosphere – deforestation now accounts for about 20% of carbon dioxide emissions each year. Conservation International has more information on saving forests from global warming. Consider the impact of your investmentsIf you invest your money, you should consider the impact that your investments and savings will have on global warming. Check out SocialInvest and Ceres to can learn more about how to ensure your money is being invested in companies, products and projects that address issues related to climate change. Make your city coolCities and states around the country have taken action to stop global warming by passing innovative transportation and energy saving legislation. If you’re in the U.S., join the cool cities list. Tell Congress to actThe McCain Lieberman Climate Stewardship and Innovation Act would set a firm limit on carbon dioxide emissions and then use free market incentives to lower costs, promote efficiency and spur innovation. Tellyour representative to support it. Share this list!Send this page via e-mail to your friends! On this note of still some hope let me be the very first to wish all of you a happy good night!